For the first time in program history, the Clemson Tigers recorded back-to-back road wins over ranked opponents after downing No. 22/18 Florida State, 57-45, Sunday afternoon. Defense was the name of the game in Tallahassee as neither team reached the 60-point mark despite both teams averaging above 70 points per game heading into the contest. 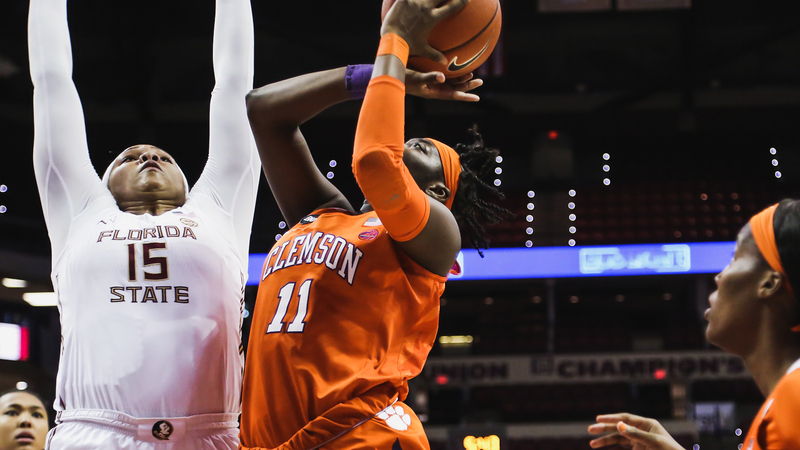 The Tigers set the tone early, holding Florida State to just 26 points in the first half, tied for the third fewest first half points by the Seminoles this season. Clemson did not allow Florida State to score more than 13 points in any quarter, marking the 10th time in school history that the Tigers have held their opponent to under 15 points in every quarter (since quarter era began, 2015). The game was anything but pretty as the teams combined for 41 turnovers. The Tigers forced Florida State into 23 turnovers, a season-high for the Seminoles and the 11th contest that Clemson has forced at least 20 turnovers. 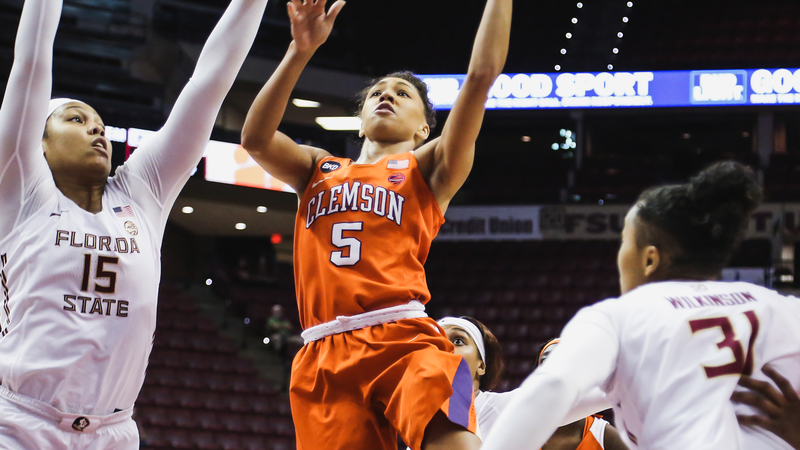 The Tigers capitalized on their opportunities, pouring in 20 points off turnovers in the game. Clemson currently ranks 21st in the nation in forced turnovers per game, third among power five schools and first in the ACC with 21.59 per outing. The Tigers are a team that plays aggressive in the backcourt, which is evident in the 347 total forced turnovers this season (seventh in the nation). The most telling number in the contest was Florida State’s .266 field goal percentage, a season-low for the Seminoles and just the fourth time this season that they’ve shot under 40 percent. 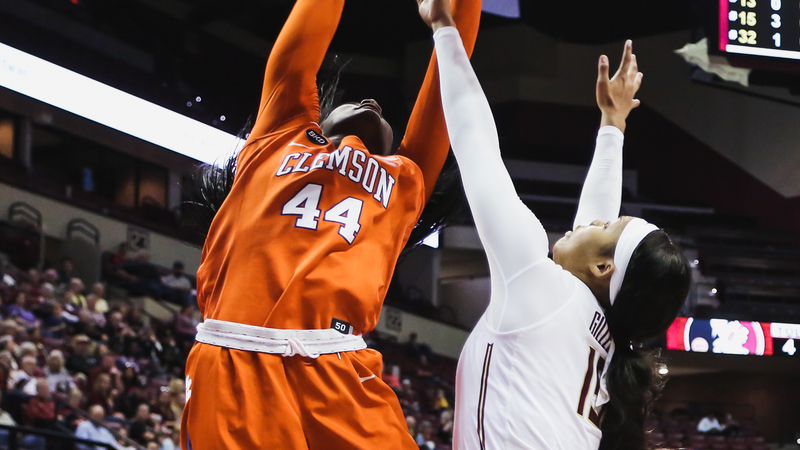 The Tigers remained in the face of the home team, creating pressure and forcing Florida State to take chances late in the shot clock. From 3-point range, the Seminoles shot 16.7 percent, knocking down just 4-of-24, a low number for a team averaging 6.4 threes a game this season. 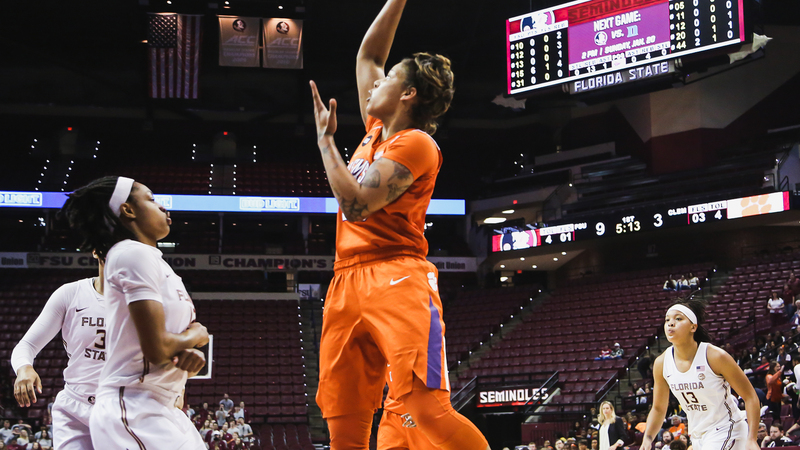 By limiting Florida State’s three-balls, the Tigers were able to hold the home team to 45 points, the third time this season that Clemson has held an opponent to under 50 points. 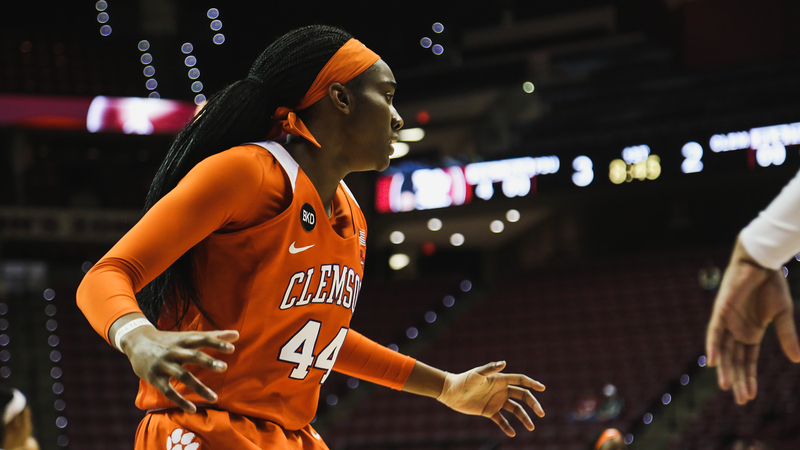 While they were outrebounded in the game, 46-37, the Tigers got the boards that mattered, led by junior Kobi Thornton who hauled down 10 for her 14th career double-double. 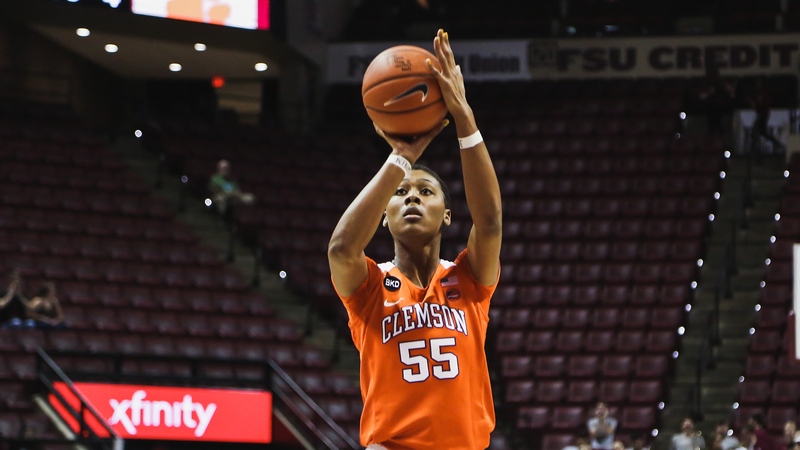 Sophomore Tylar Bennett continues to be a presence down low, blocking three shots in the game for her seventh multi-block contest of the year. 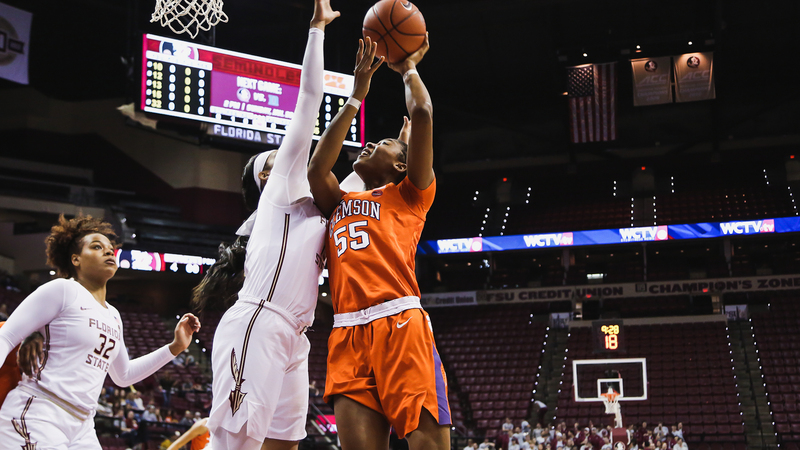 The post player currently ranks sixth in the ACC in blocks per game with 1.6. Clemson is back in action on Thursday when they take on Georgia Tech in Littlejohn Coliseum in what is sure to be a scrappy battle between two defensive-minded teams. Tipoff is slated for 7 p.m. and the game will air on ACC Network Extra.